COLORADO SPRINGS, CO--(Marketwired - Jan 28, 2016) - Cannabis Science, Inc. (OTC PINK: CBIS), a U.S. company specializing in the development of cannabis-based medicines, is please to announce additional cannabinoid medicinal product releases, this time through its Purple Haze Properties partners focused on a brand new line called "Jimi's Meds" being produced in varying dosages of CBD, THCa, and THC depending on the needs of each licensed patient in the State of California. The eCommerce site is live and ready to take orders from licensed self-medicating consumers in the State of California via www.jimismeds.com, powered by Cannabis Science. Purple Haze Properties, headed by Andrew Pitsicalis and Leon Hendrix, the brother of the late rock and roll legend, have committed to releasing multiple medicinal cannabinoid products with Cannabis Science; keep checking back for new products being released forthwith. For the hands on experience, "Jimi's Meds" product line is being showcased at the High Times Cannabis Cup in Southern California over the next two weekends; January 30 and 31st, and February 5th and 7th. The "Jimi's Meds" non-psychoactive CBD + THCa 50mg blend has been entered into the CBD edibles category, while the pure THC 25mg psychoactive supplement has been entered into the THC edibles category. "We are very excited to create a product line designed to help people with Cancer, AIDS, PTSD, Depression, Alzheimer's and other crippling ailments. We are very pleased to debut 'Jimi's Meds' Cannabis Capsules at the High Times Cannabis Cup Expo alongside a few of our other products for both weekends. We estimate 50,000 attendees at the event; please come see us at our booth and join enthusiasts of the greatest Guitarist in rock and roll history. 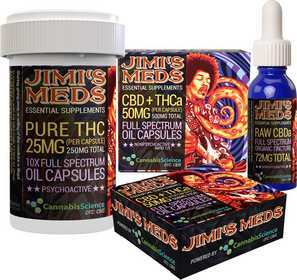 You can also find 'Jimi's Meds' for sale in select California dispensaries. We will be adding and licensing many more product lines in all our Jimi's Cannabis Collection Divisions," stated Mr. Andrew Pitsicalis. "We are excited to be a part of launching 'Jimi's Meds' in California, in partnership with Purple Haze Properties. We think we'll get great feedback on our new products, which are inspired by the legendary rocker, Jimi Hendrix. Andrew Pitsicalis and Leon Hendrix have been working hard to get the first set of 'Jimi's Meds' products entered into the 2016 High Times Cannabis Cup competition, which should help create publicity for their new product line. We are proud to assist bringing their Company initiatives to fruition, we are proud to be their full fledge partners, and we look forward to seeing you at the event," stated Cannabis Science Inc., President & CEO, Co-Founder, Raymond C. Dabney. Purple Haze Properties, LLC was founded through a partnership between Andrew Pitsicalis and Leon Hendrix, blood brother to the legendary guitar icon, Jimi Hendrix. Purple Haze Properties, LLC is one of the premiere sources for Jimi Hendrix cannabis related products. They participate in all aspects of the cannabis industry including Licensing, Social, Medical, Music and Entertainment areas. The company also provides support for Jimi's surviving nieces and nephews. Forward-Looking Statements This Press Release includes forward-looking statements within the meaning of Section 27A of the Securities Act of 1933 and Section 21E of the Securities Act of 1934. A statement containing words such as "anticipate," "seek," intend," "believe," "estimate," "expect," "project," "plan," or similar phrases may be deemed "forward-looking statements" within the meaning of the Private Securities Litigation Reform Act of 1995. Some or all of the events or results anticipated by these forward-looking statements may not occur. Factors that could cause or contribute to such differences include the future U.S. and global economies, the impact of competition, and the Company's reliance on existing regulations regarding the use and development of cannabis-based drugs. Cannabis Science, Inc., does not undertake any duty nor does it intend to update the results of these forward-looking statements. Safe Harbor Statement. The Private Securities Litigation Reform Act of 1995 provides a 'safe harbor' for forward looking statements. Certain of the statements contained herein, which are not historical facts are forward looking statements with respect to events, the occurrence of which involved risks and uncertainties. These forward-looking statements may be impacted, either positively or negatively, by various factors. Information concerning potential factors that could affect the company are detailed from time to time in the company's reports filed with the Securities and Exchange Commission.